I recently attended the premiere of this film by Charles Sandbach ,and the rest of his crew at Broxburn. It was a well attended event despite the appalling weather, some travelling hundreds of miles to get there in eager anticipation. The film did not disappoint, it was a beautifully made production which everyone found very moving, indeed there is a point in the film where Robin Thompson the narrator is reduced to floods of tears. I have been given permission by Charles to show a short clip of film, this clip tells how the MM was won, please note that the quality of the clip is nothing like the quality of the finished film due to limitations of size and bandwidth, it is of superb quality with a stirring soundtrack. I won't go on to too much detail about the film, if would be a shame to spoil the moment for you when you see it. If you would like to find out more about the film and the team (including my good self for a brief time) can I suggest that you go along to the Inspired Productions website. All being well the film should be out in November of this year, bang on time for the 90th Anniversary of the end of the Great War, and is fitting tribute to a young man who was 'one o oor ane'. 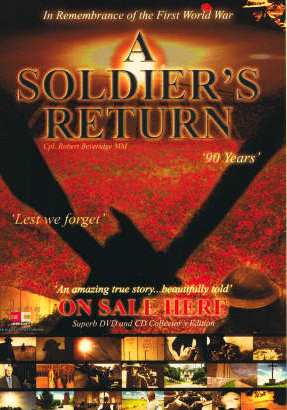 A Soldier's Return is indeed available, and can be purchased from the webstore.